One of the frequent questions we hear: What can I expect my ironman time to be, based on my half ironman finish time in another race? Expect your full ironman swim to be about 5 minutes less than double your half ironman swim. Double your bike split and add 15 minutes. And double your half ironman time and add about 30 minutes. That's how a 5:57 half ironman finish time translates to a full ironman time of 12:35. How Much Time Does it Take to Finish an Ironman? How Much Time Does it Take to Finish a Half Ironman? 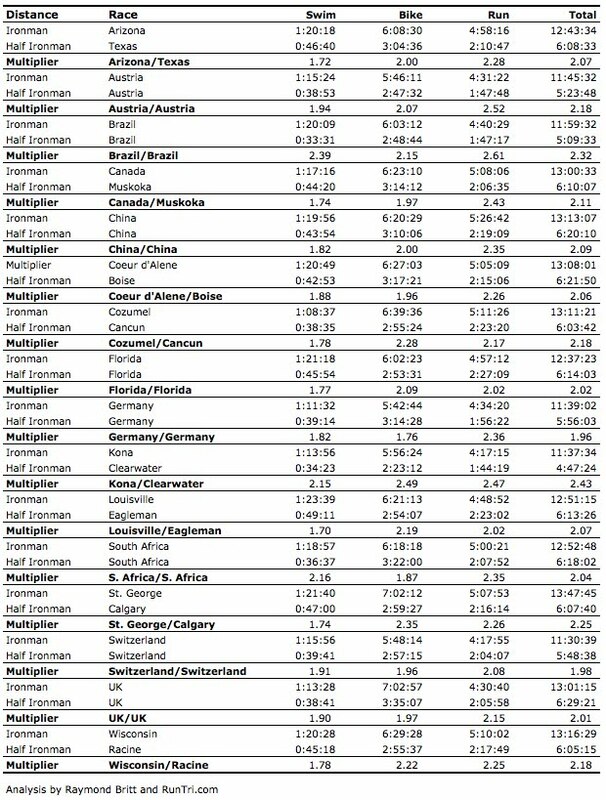 To address the naturally occurring variations from race to race, we have matched full- and half-ironman distance races that take place on the same course (e.g., China), races that take place in the same country, and races that appear to share common characteristics such as climate, terrain, etc. These pairings are, of course, subject to change. Use your race experience and the data on this chart to predict a most accurate ironman finish time based on your half ironman results. For more, see our new analysis by Age Group for New Zealand and Texas vs New Zealand. For more, see our Analysis of Top 25 Ironman Races and Top Ironman 70.3 Races.